This gate project was unusual and is worthy of an entry. The gateway was over 20 feet wide so the obvious choice was to build two gates that meet in the middle. 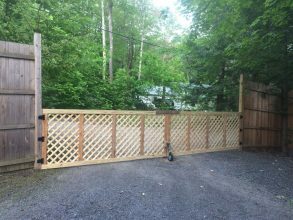 The owner wanted a nice looking gate at the entrance to his property so decided on lattice. It just so happened he is a designer and instructor of SketchUp, a 3D modeling program, so he designed the gates himself and sent me a printout. 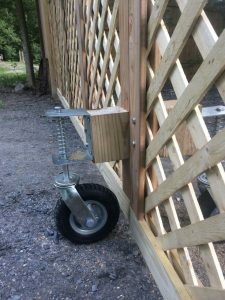 We had discussed how a 10 foot gate produced a lot of force on hinges, gate and post so a wheel to support the end made sense. Not only did he incorporate the wheels in the design but he ordered the specific wheels and had them shipped to the job! Ya, I was pretty spoiled on this job. Assembling them went smoothly but installing them produced a twist in the gates I didn’t like. I installed the wheels with this in mind noticing that the the wheels were mounted on offset blocks and could compensate for the twist. By mounting the wheels on opposite sides, they not only carried the weight of the gates but removed the twist and brought them into vertical alignment. For a latch I wanted something that would help hold the gates in horizontal alignment so I made a “C” channel from the scraps and found a piece of threaded rod for a hinge. It fit snuggly over 16 inches of each gate when closed. In the open position this gate only needs a small block for the wheel to carry some weight. In the open position the wheel still carries some weight. The wheels prevent too much strain on the gate, hinges and posts.